Shodo is a wonderful guide and practice book on Japanese calligraphy. It's written by Shozu Sato, a renowned master of traditional Zen arts. 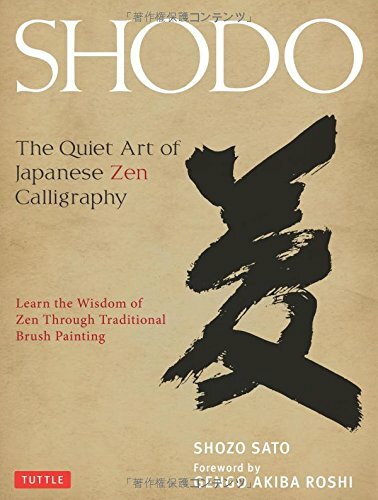 This book covers the shodo, which is the traditional Japanese art of brush calligraphy. It talks about the art of writing Kanji, the characters shared by Chinese and Japanese. There are techniques on how to how the brush and even details like how you should breath as the brush moves. There are a lot of subtleness when it comes to writing and many of which I'm not even aware of. The later chapters are where you can practice your calligraphy skills. Presenting in various chapters are ideograms ranging from 1 to 8 characters. Each comes with with an explanation of the meaning behind the words and they are all zen sayings, e.g. "Everyday is a good day", "Wherever, become your own master" and many more. These practice chapters have the characters written in two styles, the Kaisho and Gyosho styles, complete with directions of the brush strokes so that you can follow along. The last chapter takes a look at the work of several calligraphy students and you can see that each individual will have their own style, even when they are all taught the same way to write. There's certainly personality within each character and also the brush itself. Learn the Wisdom of Zen Through Traditional Brush Painting. That's what this book is about.